Pssst... hey coach… listen up. This is IMPORTANT. 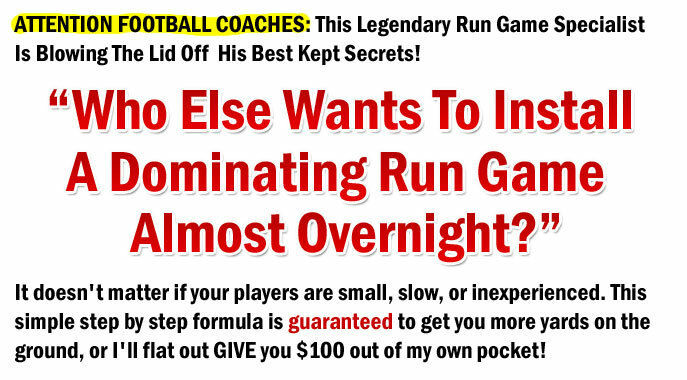 You're about to discover some surprising secrets about the running game that 99 out of 100 folks will never learn. 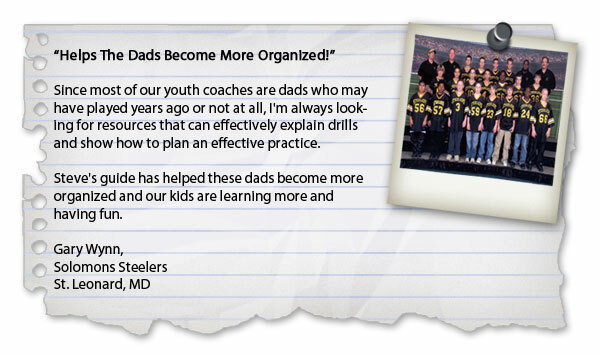 Secrets that will transform your approach to coaching football… dramatically boost the effectiveness of your playbook… and give your coaching staff the confidence and skill to lead your team to victory. Secrets that will inject your players with the mental and physical tools to dominate the line of scrimmage… and rack up more yardage, more first downs, and more TD's than you ever thought possible. Secrets that will mold your team into a finely tuned offensive machine, and steamroll your competition with an unstoppable ground attack. It's a little know run game success formula that's been tried, tested, and proven at the highest levels of college football. Powerful enough to work for the highest ranked offense in Division I FCS Football. Simple enough to work for "everyday" youth and high school teams like yours and mine. Master this simple formula and I guarantee your offensive performance will improve… faster and more dramatically than you ever thought possible. And finally realize the satisfaction and glory of coaching a championship football team. Best of all, if this formula doesn't work for you, I'll give you 100 bucks for your trouble (more on that later). 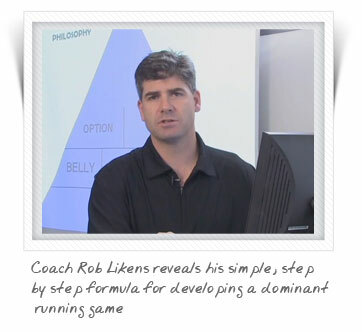 The genius behind these secrets is none other than Rob Likens - the NCAA Football legend who even the top dogs go to for run game advice. You might know him as the Assistant Head Coach at Louisiana Tech… or the highly touted Offensive Coordinator for FCS "scoring machine" Central Connecticut State. Under Likens, the CCSU Blue Devils led their conference in scoring offense in two seasons, had three undefeated home records, and averaged nearly 30 points per game. In 2006, his squad led the NATION in rushing yards per game (284.9), and racked up 42 rushing touchdowns in just 11 outings. Master your bread and butter run plays. You don't need 12 different offensive formations… a 500 page playbook… or a 67-point victory plan. Out execute your opponent with great technique. While the X's and the O's are important, it's the Jimmy's and the Joe's who really make the difference on the field. Make sure you understand the key skills your offensive linemen, quarterbacks, wide receivers, and running backs need in order to execute your run game to perfection. Pay special attention to to blocking schemes, handoffs, and footwork - and design your practices to focus on those techniques. Defeat your opponents will to win. Just to be clear, this is not about "talking trash" using "cheap shots" or "playing dirty." It's about becoming the toughest and most intimidating team on the field. Coming right into your opponents' grill with a relentless attack, never taking a play off, and physically demoralizing them until they cry "Uncle!" It's not like you can just roll into practice tomorrow, read off those bullet points, cross your fingers and hope your players suddenly "get it." You need to understand the specifics… how to develop a run game philosophy and communicate it to your team… how to implement the plays that give you the best opportunity for success… how to teach the critical techniques and skills to gain an advantage over defenses and move the ball upfield. 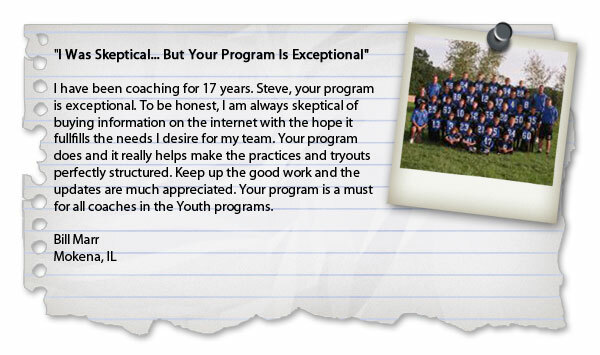 Coach Likens understands those skills better than anyone in the game. And, more importantly, he knows how to teach them in a simple, clear way that anyone can understand. You don't need to experiment with new plays, try out unproven drills, or reinvent the wheel. Because today, for the first time ever, you can learn Coach Likens' entire run game formula, on video, right over your computer screen or mobile device! 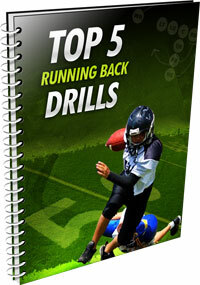 All of his best kept "lockbox" secrets are now being revealed in a new package called "Developing A Dominant Running Game." 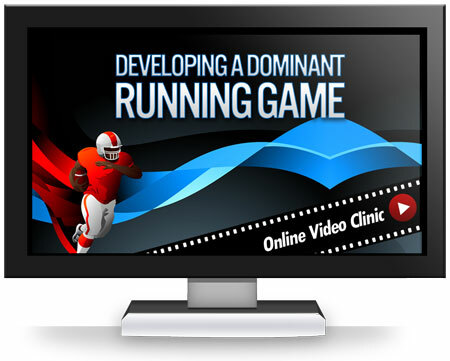 It's the most comprehensive resource on running the football I've ever seen… with more than 182 minutes of video… 3 special reports… and dozens of killer drills, tips, and coaching pointers you can take right to the field. Before you can start building your run game dynasty, you need a solid foundation -- a thorough understanding of why you're running the ball, what you're trying to accomplish with it, and how it fits into your overall offensive game plan. That's what part 1 is all about -- developing a run game philosophy that meets the goals of your program, and communicating that approach to your team. A big communication mistake coaches at ALL levels make. It's the biggest reason some kids ignore your advice, "tune out" your speeches… and make costly strategic errors on the field. The 4 big reasons your running game is so important - critical stuff to help you explain your offensive philosophy to your coaching staff and players. A "pyramid" planning strategy to help organize and prioritize your play calls. No matter what level you coach or how little experience you have! For each one, Coach Likens starts with an explanation of the key terminology, overall goals, and strategic importance of the play. You'll learn the best situations to run the play, how often you should run it, and how it fits within your overall offensive game plan. Next, he gets down to the real nitty gritty, showing you the specific positional responsibilities for every player on the field. Using straightforward whiteboard diagrams, you'll see EXACTLY how to block each play against the most common defensive fronts, including the 4-3, 8-Man, Under, 3-3 Stack, and 3-2. Plus, primary running routes for your ball-carriers… and critical reads and adjustments to help your players react to what the defense is giving them. Last, but not least, Coach Likens uses real practice and game footage to demonstrate each play against live Division I competition. You'll want to pay CLOSE attention here, as he reveals dozens of killer coaching cues and pointers to help you shorten the learning curve… and get the maximum offensive "punch" on every single down. The third segment of this online clinic is all about skill development - learning the specific fundamentals, mechanics, and techniques you'll need to execute your blocking schemes, hit the holes, and break out for massive gains. The #1 key for executing a solid pull block, and maximizing the effectiveness of your Belly and Trap plays. HINT: watch the direction of the first step! How to increase first-step explosion with a simple "force-skipping" drill. Do this for 5 minutes every practice and your players will immediately fire off the ball with more force and power! A two-part "Crossover" drill progression that injects your kids with cat-like agility… and immediately translates to better blocking footwork. A killer drill that helps your o-linemen maintain proper technique -- from the opening kickoff to the final whistle, even when they're sore, winded, or dead tired. An "Ant Hill Stomp" technique that teaches your players how to drive opposing linemen back off the ball, and open up massive running lanes for your backs to scamper through. How to use "Bucket Steps" to set up a devastating reach block -- This technique is critical for executing the Zone Option and Outside Zone Plays. A simple step by step progression for teaching the Down Block, including footwork, body position, punch placement and mental approach. How to use footwork and spacing to disguise your Option plays. Stop telegraphing your plays to the defense, and discover this simple secret to maximizing the "surprise factor." The EXACT footwork your running back should use for the Power and Belly plays. Eliminates false steps, improves timing, and helps you squeeze the most yardage out of every single play! In this final segment, Coach Likens takes you through his 10 key practice blocks, and explains exactly what drills he used to develop one of the top running offenses in the NCAA. Implement this plan and you'll see an immediate boost in your practice efficiency, better communication with your coaching staff, and - most importantly - better offensive performance on the field! The best drill for getting your center, quarterback, and running backs comfortable with ball exchanges and handoffs… so you can eliminate those costly fumbles, and execute your running plays with flawless perfection! 7 drills that MUST be part of your Individual Skills time. Learn exactly what to do with your OLs, QBs, RBs, and WRs to maximize the effectiveness of your run game. Small group and full team drills to practice your run plays against a "live defense." 4 FREE Bonus Reports Valued At $84.85! To start, I pulled together my all-time favorite run game drills, and created 3 incredibly useful PDF bonus reports you'll absolutely love! All the drills are designed to target the specific skills your players need to learn, so they can out-execute your competition on the field, and experience the glory of a dominant running game! "Top 5 Offensive Line Drills"
"Top 5 Running Back Drills"
"Top 5 Run Game Combo Drills"
The fourth bonus is an online video clinic from Coach Brian Billick, former offensive coordinator with the Minnesota Vikings and head coach of the 2001 Superbowl Champion Baltimore Ravens! From run plays, to pass plays, openers, 3rd down conversions, red zone offense, and special plays. 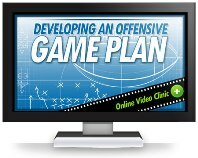 You'll discover how to create a play package that maximizes your strengths and exploits your opponent's weaknesses... how to focus the package into a weekly game plan and practice format... and, how to lay out the plan for game day execution. 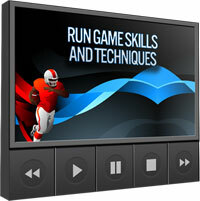 The perfect complement to your run game clinic! Until now, the only way to learn this material directly from Coach Likens would be at one of those big, overpriced national coaching clinics in Las Vegas or Orlando. By the time you paid your admission ($100), air fare (at least $200), hotel and meals (another $200)… you're in the hole $500 or more. But today, we're bringing Coach Likens to you - right in the comfort of your own living room or office, for just $99 $69 (or 3 easy monthly payments of $23). Choose your payment option below, then click on the orange "Add to Cart" button to place your secure order now. Your payment is processed on our secure servers, and your privacy is 100% protected. There are 3 easy payment methods for your convenience: Credit Card, Debit Card, or PayPal. You get instant access to the online clinic as soon as your payment is approved. Stream the videos over your Internet connection, save them to your computer, or watch them on your iPhone, iPad or other mobile device. The Internet is filled with more drills and coaching tips than you can shake a stick at. It's hard to tell which ones are worthwhile, and which ones are just a waste of time. So I understand why it might be tough to pull the trigger on an investment like this (even though the price is so low). So let me emphasize one important point. This is NOT some pie in the sky "theory" video that you'll watch once and never actually use. Every tip, drill, and coaching pointer that you'll learn was built on years of testing, trial and refinement at the highest levels of college football. If it worked for the #1 rushing offense in Division I FCS, it WILL work for you. And to show you I'm really serious, I want to offer you something special. A ridiculously generous guarantee that's impossible to refuse. 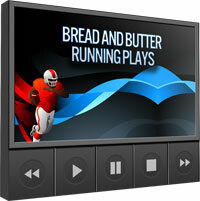 Install the running plays. Try out the drills. Implement the practice planning tips. If you're not 100% impressed with the material... if you don't see an immediate improvement in your run game yardage, first downs, and scoring... just let me know and I'll cheerfully refund your entire payment right away. They think that some unscrupulous folks will try to take advantage of this and screw me over. But I trust you, and I know you'll give this a fair shake. And in the end, the $99 $69 for the online clinic will be the best investment you'll make all season. If you aren’t ready for what I offer that’s fine. Some of these secrets and tactics are so far out of the “mainstream” that only experienced coaches know how well they work. But if you ARE interested, please don't hesitate. The $99 $69 introductory price is WAY lower than what we normally ask for a package like this, and I may give in and raise the price soon. Click here to get started now and get instant access to everything. If you decide to "think about it" and come back later, you could wind up paying a whole lot more. Are you going to take action? Or keep sitting on the sidelines? 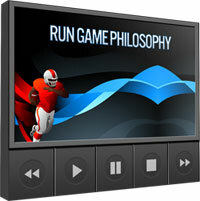 PS - Let's do a quick recap of everything that's included inside "Developing A Dominant Running Game." As you can see, we could easily ask $200 (or more) for this entire package. But if you order today, it's all yours today for just $99 $69 (or 3 easy monthly payments of $23). Don't hesitate and miss out on this incredible deal. Get started today by selecting your payment option below!